Now that that's out of the way...I'm going to share a few things from my printer's drawer from my childhood. The "J" pin was my mother's mother. Her name was Josephine. Not Josie, though you could get away with calling her Jo. Never Josie! Her title was "mother", not "ma" or "mom." She wore gaudy jewelry. 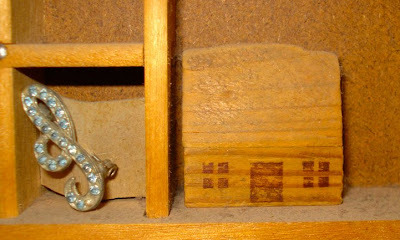 The house block came from a set of building blocks we once had. 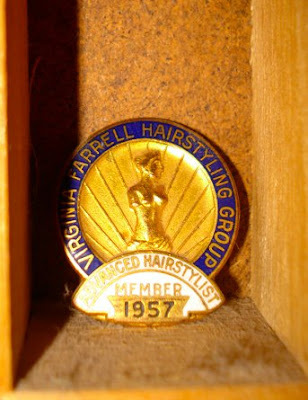 Grandma Josephine's pin from a hairstyling school. She got into BIG trouble with my mom once. My sister had very long and beautiful hair when she was 3. Grandma cut it super short and permed it, without asking my mom!! Mom didn't talk to her mother for as long, long time. My Bluebird Girls key chain and my roller skate's key. I used to wear the key on a black velvet rope around my neck. I can still feel it swaying back and forth as I skated up and down the sidewalk in front of my house. 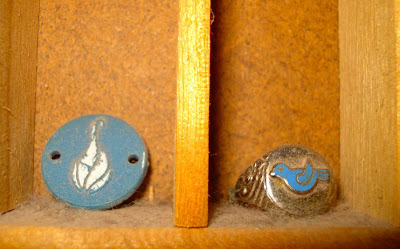 A Campfire Girl token of some sort and my Blue Bird girl's ring. I don't see any dust? Do you?? 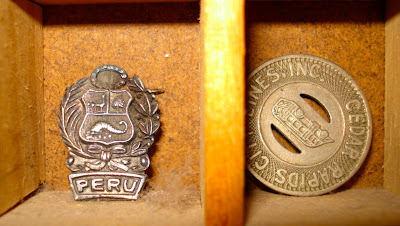 I have no idea where the Peru pin came from or where the bus token came from. I've never ridden the city bus. 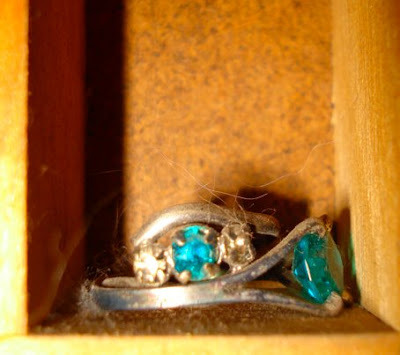 A couple of my birth stone rings. I paid $1 for each of them at the local jewelry store in town. 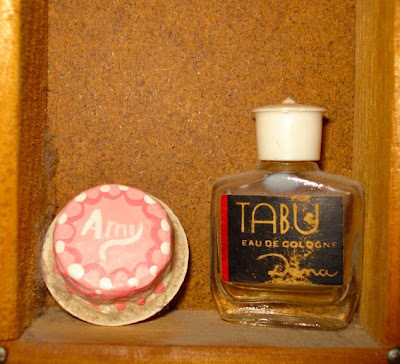 A sample bottle of my mom's favorite perfume. My mom made the cake for me after I was grown and out of the house. She was into ceramics for a while. I don't think there was a craft she didn't try at least once. 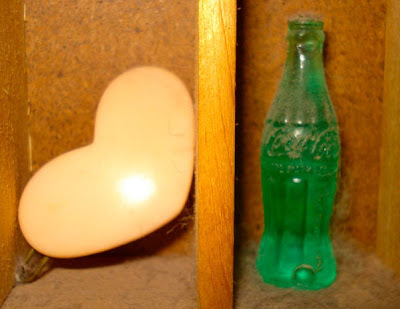 I have no idea where I got the Coke bottle. Isn't it cute?! This is a small clay vase that once had straw flowers glued in it. My mom painted the picture of the birds on it. It matched the wallpaper that was in my room. 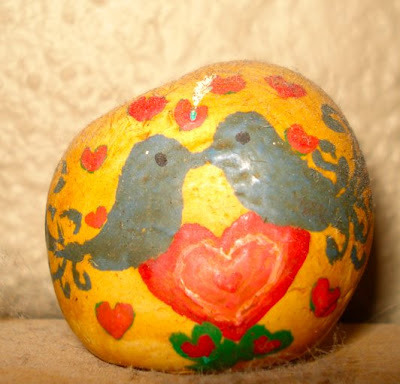 As much as I love all these keepsakes (and particularly the story about Grandmother cutting sister's hair - egads! ), I really appreciate that you just go ahead and photograph and post without worrying about dusting and detailing - - - - you definitely have the right idea about things; I could learn from you! What a fun post! I love that you display your treasures. That is really a clever idea to display all those. 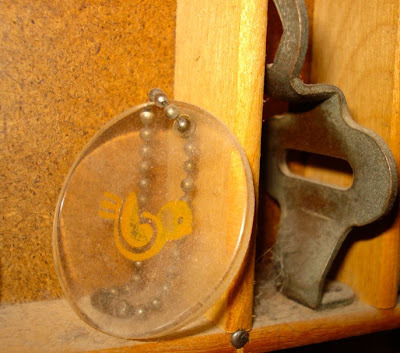 I have a lot of the same kind of things but they are in my jewelry box. I will have to look for something like that and put it in my bedroom. Thanks for the idea! 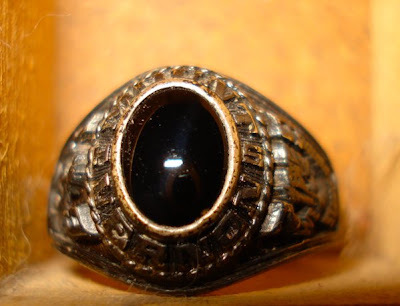 Amy, I was a bit spoiled and got exactly what I wanted for my class ring, and I still only wore it for a very short while.